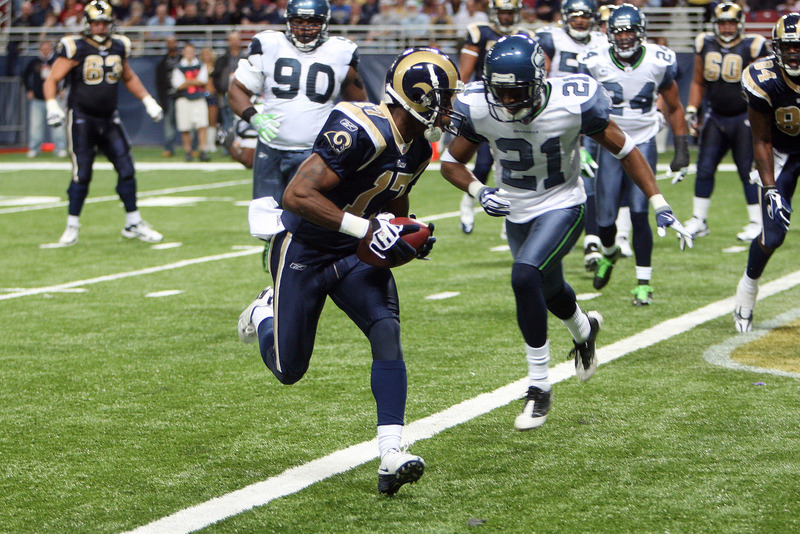 Playing in front of a half-filled dome, the Rams dropped to 1-10 on the season losing to Seattle 27-17. Justin Forsett ran for a career best 130 yards and two touchdowns, but it was Seattle’s defense that supplied the game winning touchdown. Kyle Boller starting for the injured Marc Bulger was picked off twice including once inside the two minute warning of the first half. That 65 yard INT return for a touchdown by Seattle’s Josh Wilson gave Seattle a 14-7 and they never looked back. Boller threw for 282 yards including this touchdown to Donnie Avery (photo courtesy of Bill Greenblatt, UPI), but the two picks hurt. 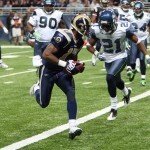 Steven Jackson who seems to be the only bright spot for the Rams these days rushed for 89 yards stopping a string of what would have been five straight games of 100+ yards rushing. The Rams have now lost 10 in a row at home and 10 straight to Seattle. Just 47,475 fans were at the game, the worst attendance for a Rams game in 15 years.